The Proof That Ireland Has Uniquely Bad Weather. We like to complain that it’s always raining in Ireland. 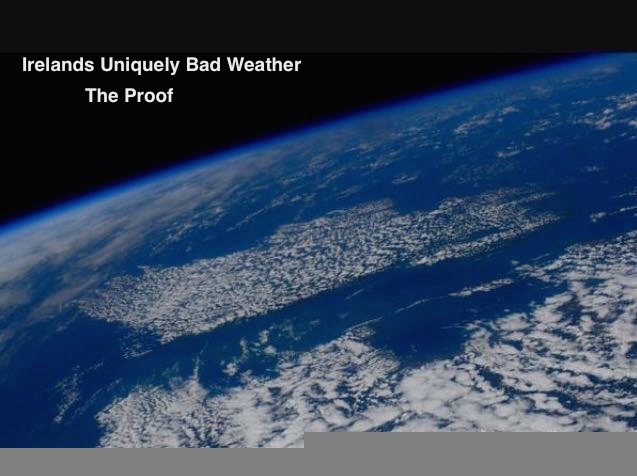 Now thanks to an Italian Astronaut we have proof of how bad things really are! Look at that picture again. It was taken in June!! Now consider just how many other countries in the world have clouds that hug their borders? Not many I bet. The fact that Italian astronaut Samantha Cristoforetti thought it was worth tweeting means even she thought it was strange. And she’s spent 200 days looking down at the planet from space. So if anyone ever again doubts that Ireland has uniquely bad weather just send them here. We’ll put them straight.